Small robotic birds are showing lots of promise for tasks such as monitoring the environment and conducting surveillance. But one current drawback they have is the amount of time they are able to stay aloft. Because of the birds' light weight and small size, the tiny batteries used to power them deplete in just a few minutes. University of Maryland Professors S.K. 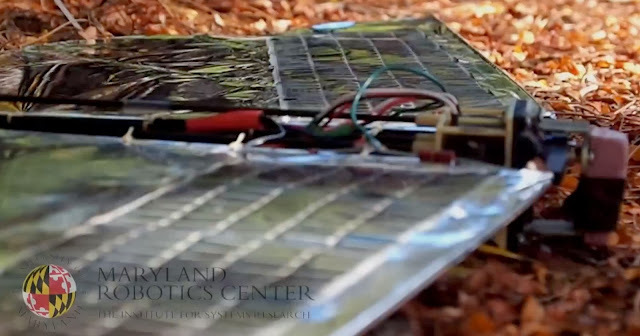 Gupta and Hugh Bruck and their students in the Maryland Robotics Center are working on a solution that will allow longer flights and battery recharging in remote places without electrical outlets. The Clark School of Engineering team has developed and demonstrated a new version of its Robo Raven micro air vehicle (MAV) that incorporates solar panels in its wings. While the solar panels do not yet produce enough energy to power Robo Raven III in flight (they produce around 3.6 Watts while Robo Raven needs around 30 Watts to fly), they are effective in charging the MAV's batteries when it is stationary. Gupta notes that the development team envisions Robo Raven flying "far away from civilizations" during long missions and needing "a way to 'feed' itself" on its journeys. Because Robo Raven's large wings have enough surface area to create a usable amount of solar energy, the team decided to incorporate flexible solar cells into them. The captured solar energy is then used to supply Robo Raven's onboard batteries. "These new multi-functional wings will shape the future of robotic birds by enabling them to fly longer, farther, and more independently because they will be getting their power from the sun," says Mechanical Engineering Ph.D. student Luke Roberts, a member of the Robo Raven team. "We still need to make significant improvements in solar cell efficiency and battery energy density to replicate the endurance of real ravens in Robo Raven III," Gupta says. "But the good news is that Robo Raven III has already demonstrated we can fly with a solar cell and battery combination. Now that we've successfully taken this step, swapping new technologies that are more efficient should be relatively simple." Gupta has been working on flapping-wing robotic birds for the better part of a decade. His team first successfully demonstrated a flapping-wing bird in 2007. Robo Raven, the first flapping-wing MAV with independent, programmable wings, was introduced earlier this spring. Gupta holds a joint appointment in Mechanical Engineering and the Institute for Systems Research, and Bruck is a Mechanical Engineering professor.